Reforming Fundamentalism helped me understand the tendency that renewal or reform movements have toward fragmentation and internal conflict. Its much easier to unite in opposition to the status quo than it is to remain united while setting out in a new direction. At one point Marsden writes of the Machen followers in the Presbyterian church, “as with all revolutions, they agreed on what they were against, but unresolved differences between the cobelligerents became apparent as soon as they attempted to define their own positive course” (43). I think there may be some truth to this insight with respect to FTS as well. Its foudners were united in their opposition to liberalism, their desire to reform fundamentalism, and their vast academic and cultural ambitions. But there was also some differences under the surface – different stances toward Bela Vassady, different visions for Christianity Today, different attitudes about the Revised Standard Version of the Bible (Edward John Carnell and William Lasor debated Gleason Archer and Everett Harrison on the new translation at Lake Avenue Congregational Church upon its release), and so forth. Reform movements must work very hard to not lose their momentum and fragment once their initial, reactive energy has faded. How do they do this? I don’t know, but again I sense that our identity must be positively grounded as well as negatively. A merely reactionary identity cannot sustain prolonged reform efforts amidst the difficulties of life. We must know what we are for not less than what we are against. 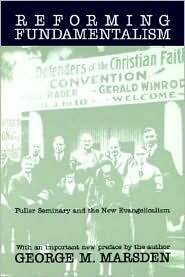 “The shapers of Fuller had long hoped that the attitudes and emphases that had grown up in the fundamentalist decades of the 1920’s, 1930’s, and 1940’s could be repudiated and that evangelical orthodoxy could return to the balances of its earlier days. With the exception of Woodbridge, who went over to the fundamentalist side, each of the Fuller faculty identified to some extent with the new evangelicals and hence with a version of this ideal. What they did not entirely reckon with, however, was their own history. Though Fuller was new and in a seemingly historyless part of the country, its faculty was made up of people who were all powerfully shaped by the fundamentalist heritage. Fundamentalism was not just something external that could be abandoned at will” (170). Turning a corner is always difficult. There is always friction in moving in a new direction, in changing the conversation. We are all, like it or not, part of traditions – and the traditions we are a part of set the agenda of our lives far more than our own personal decisions. We may try to set out in a new direction, but we are always, to some extent, reacting to our past. This is not a reason to never seek change – but it is a reminder not to underestimate how difficult, how costly, change can be. Well, that concludes my series of posts on Marsden’s Reforming Fundamentalism. It is a fascinating story from which I learned a lot, and it made me grateful to be a part of the evangelical tradition, which has from its outset been seeking to remain faithful to the gospel and to the church’s mission in the face of many different kinds of pressures. Following this story, learning about its major players, understanding where the battles have been fought – all this clarified and made more intelligible various aspects of evangelicalism today. Learning about the past casts the present moment in such a clearer light – and helps us prepare for the future.